The folks on the Right are apoplectic these days that Governor Roy Cooper thinks it’s a good idea to follow the lead of Vice-President-elect Mike Pence, Chris Christie, John Kasich and 28 other governors and expand Medicaid to provide health care coverage to 500,000 people in North Carolina and help local hospitals while creating thousands of jobs in the process. Last week Cooper told a business audience that he was pushing ahead with Medicaid expansion under the Affordable Care Act despite the uncertainty of the future of the health care law in Washington and a state law passed by the Republican General Assembly in 2013 that sought to prohibit the state from expanding the program. That law, passed over the tepid objections of then Gov. Pat McCrory, is the focus of the outrage with one prominent conservative talking head calling Cooper’s proposal to challenge it and expand Medicaid anyway a “colossal blunder” and another prominent right-wing think tanker startlingly detailing on a statewide talk show the impeachment proceedings that might result in the General Assembly if Cooper proceeds with his plan. The Right would rather not talk about what Medicaid expansion would mean to North Carolina, the lives it would save, the people who would be able to see a doctor when they were sick instead of flooding into emergency rooms, the $4 billion in federal funding it would bring into the state, or the struggling hospitals it would benefit. They know they’d lose that argument. They never could come up with an real explanation for why North Carolina was leaving half a million citizens without health care coverage while states with Republican governors like Pence and Kasich worked with the Obama Administration to tailor a specific plan to cover people in their states. McCrory never really tried, unwilling to confront the legislative leadership of his own party who repeatedly made it clear that they were in charge in Raleigh, not the governor. But things have changed. Cooper pledged during the campaign to support Medicaid expansion and he’s trying to living up to that promise, whether the leaders in the General Assembly like it or not. Never mind that the federal government pays 95 percent of the expansion initially and 90 percent after that or that studies have shown the state actually would save money in the long run by expanding the program. It wouldn’t bust the budget at all. It would help the budget, not to mention providing a lifeline to half a million people. As to the oath of office and the brazenly illegal talk, Berger and his think tank supporters need to take a breath and step away the ledge. Cooper has filed a notice with the federal government that the state intends to change its Medicaid plan and after ten days for public comment will file the amendment to the plan to start the expansion process. Almost certainly the General Assembly would have to change the eligibility requirements and appropriate the money for the local match unless Cooper could convince hospitals to pick up that tab, a possibility he mentioned when he announced his expansion last week. But the General Assembly would still have to play a role. 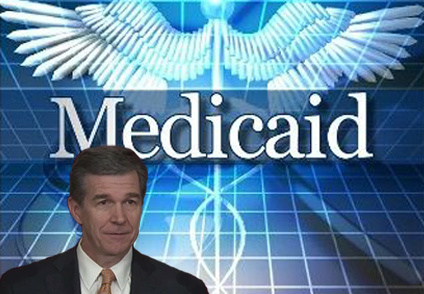 Cooper also believes that the law prohibiting the governor from seeking Medicaid expansion is unconstitutional because it infringes on his executive authority. A court is likely to have the final say about that. Lawmakers can certainly sue to stop the expansion and/or refuse to change the eligibility standards or fund the state match required for the program. But North Carolinians deserve that debate. Nobody called for the impeachment of the Republican legislative leadership when they held an unannounced and possibly illegal special session to strip powers away from Cooper and the State Board of Education. The courts will decide those questions too. That’s the way our political system works. Don’t be misled by the hysterical outrage from the Right. It’s all pretty simple. Cooper wants to take advantage of a federal program that for now is still in place to provide health care coverage for 500,000 people in North Carolina and create thousands of jobs by bringing $4 billion a year in federal funding to the state. Berger and other Republican leaders don’t want to expand access to health care or help the hospitals and haven’t since the Affordable Care Act was passed, even as other states have moved forward with expansion plans. Cooper’s not making a colossal blunder at all. He’s doing his job and correcting a blunder by McCrory and Berger and the rest of the Republicans in the process. Good for him.